1) Exercise extreme caution - Other drivers’ actions become very unpredictable. 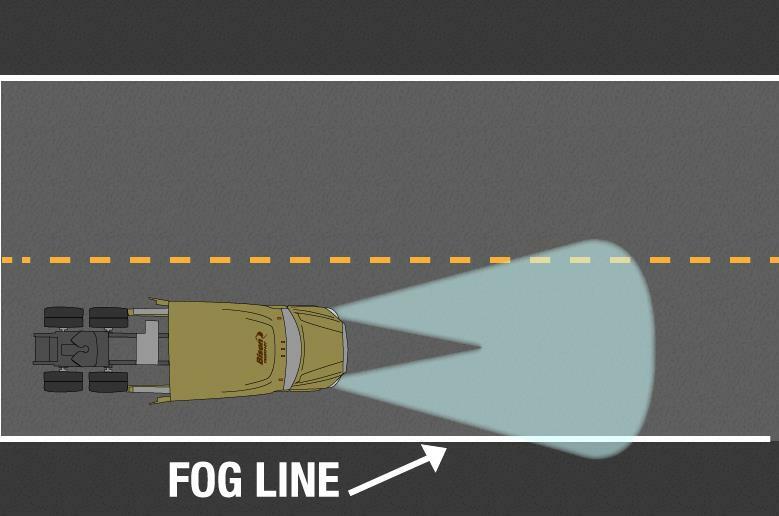 2) Use low beams and fog lights, not high beams. 3) The best solution to counteract reduced visibility and traction is to slow down, but avoid braking suddenly. Slow down carefully and gently. 4) Ensure you keep your view clear. Always keep your windshield washer reservoir full - it will be used up very quickly if you run into ice fog. 5) Avoid fogged windows by regularly using the defroster and windshield wipers. Moisture can build up on the windshield both inside and out; air conditioning might help keep moisture from building up inside the cab. 6) Minimize distractions. Turn off the music and don’t talk on your phone. Try opening your window to help listen for traffic you might not be able to see. 7) Watch for emergency stops by other vehicles. 8) Watch for slow-moving and parked vehicles. 9) Use the right edge of the road, white fog line or roadside reflectors as a guide. 10) Do not change lanes or pass other vehicles unless necessary. 11) Never stop in the travel lanes. 12) You must always be able to stop in half the distance you can see. REALTED POST: 6 'Must Know' Winter Wildlife Driving Tips!